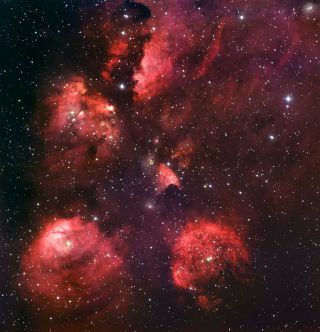 This new portrait of NGC 6334 (the Cat's Paw Nebula) was created from images taken with the Wide Field Imager instrument at the 2.2-metre MPG/ESO telescope at the La Silla Observatory in Chile, combining images taken through blue, green and red filters, as well as a special filter designed to let through the light of glowing hydrogen. A stunning new image of the Cat?s Paw Nebula reveals a regionat the heart of our Milky Way galaxy where new stars are being born at afurious pace. The nebula, a cloudof interstellar gas and dust, is a cosmic nursery where new stars are usheredinto being as these materials mix and condense. Also known as NGC 6334, the Cat?s Paw is thought to holdseveral tens of thousands of stars. Among them are freshly minted, brilliantblue stars ? each nearly 10 times the mass of our sun and born within the lastfew million years. "NGC 6334 is one of the most active nurseries ofmassive stars in our galaxy," researchers said in a European SouthernObservatory statement. The new photos were taken with the Wide Field Imagerinstrument at the 2.2-metre MPG/ESO telescope at the La Silla Observatory inChile. The view achieves its stunning pinks and purples by combining imagestaken through blue, green and red filters, as well as a special filter designedto let through the light of glowing hydrogen. The nebula appears red because its blue and green light arescattered and absorbed more efficiently by material between the nebula andEarth. The red light comes predominantly from hydrogen gas glowing under theintense glare of hot young stars. The roiling, red bubble in the lower right part of the imagemay be a star expelling a large amount of matter at high speed as it nears the end ofits life, scientists said in a statement. Another possibility is that thestar has already died, and we are seeing the remnants left behind after itexploded, they added. The Cat's Paw Nebula is about 5,500 light-years away fromEarth, in the direction of the constellation Scorpius (the Scorpion). Itextends about 50 light-years across, and covers an area on the sky slightlylarger than the full moon.